The intent of the YES Fellowship is to motivate students with a passionate interest in science and engineering to pursue a career in research by offering them the opportunity to experience a real life laboratory environment. TRIUMF is partnering with the Canadian Society for Senior Engineeers to offer the C. Gordon Lindsay Memorial Award for graduating high school students intending to pursue a career in engineering.Refer to the Program Guidelines for details. The past High School (now YES!) Fellowship winners and their projects at TRIUMF are listed on this web page. Check if any were from your school! 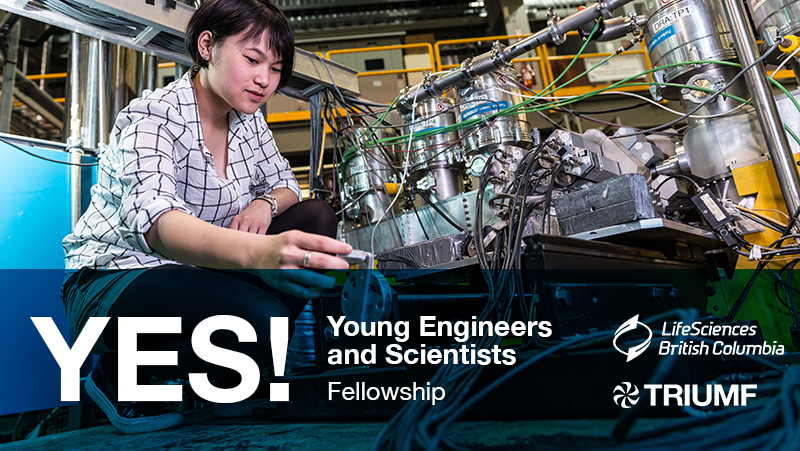 January 10, 2019: The 2019 TRIUMF YES Fellowship competition will begin taking applications again in mid-to-late February. Stay Tuned! July 1, 2018: TRIUMF and LSBC welcome their YES Fellowsh recipients - Nadia Chigmaroff, Duncan McIntryre, Helen Newton (CSSE winner), and Jack Li at TRIUMF ; and Anglea Chang, Michelle Lam, Nick Murray, Nicole Wong, and Zehan Zhou for LSBC.